Simply call the experts from Titan Home Technologies, LLC, as we have all your home theater needs covered. That's not all. Our locally owned and operated company also specializes in home automation. With us, you can make your home as high tech as you desire. Call us and let us put almost 20 years of experience to work for you. Not all home theater providers are exactly the same. To many, you're nothing more than another dollar sign. At our family-owned home theater company, we value our customers entirely. That's why we're committed to giving our customers the spaces they've always desired, and we do it at affordable prices. Most people enjoy going to the cinema to catch the latest blockbuster. Think about it, there's a reason why people take both daytime and nighttime trips to the movies. The adventure allows you to socialize with friends, family, or a loved one, while doing something you really love—watching movies. Why spend money on gas, snacks, and outrageous movie tickets to watch major motion pictures? Rely on our home theater company to give you the same cinematic experience at home with one of our custom home theaters. Movie theaters are known for their grand visuals and high-quality sounds. Until recently, it was impossible to replicate the authentic cinema-like experience. Advances in technology, however, have made it possible. This is why many homeowners are adding custom home theaters to their residences. Every home theater needs superior home theater equipment. That's where our company comes in. We're proud to be authorized dealers of everything in our inventory, which includes a wide array of products from brands you know and trust. Check out our stock today by visiting our experts in person, or viewing our inventory online. We're confident that our products won't disappoint. 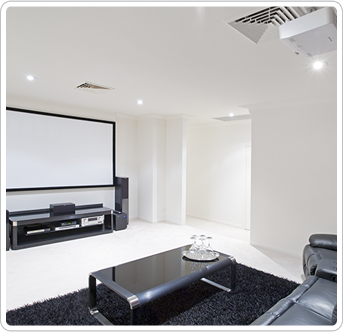 Contact us to request an affordable home theater installation that will add value to your home. Our services are available for homeowners throughout Tampa, Florida, as well as the surrounding areas. Create a high-tech home with our home theater and automation installations.